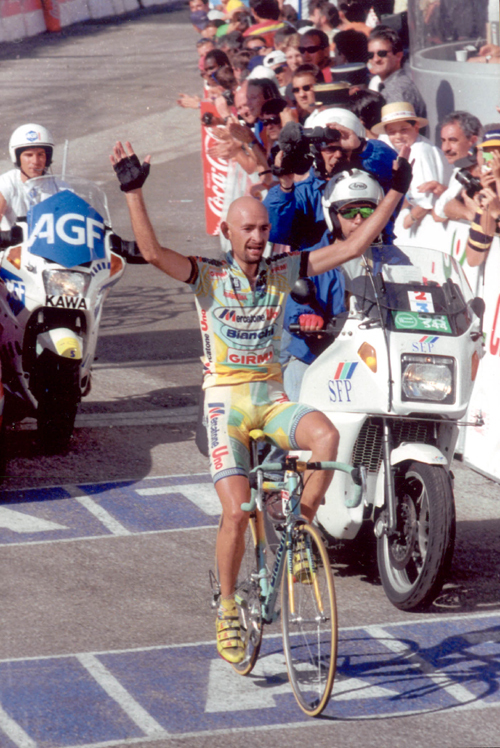 Marco Pantani (January 13, 1970 - February 14, 2004) was the last rider to win the Giro d'Italia and the Tour de France in the same year. From the spring of 1998 to the spring of 1999 he was not only the most capable climber in professional cycling, he was the the best bike racer in the world. His career was beset with accidents, particularly his terrible collision with a car late in 1995 and his crash in the 1997 Giro. 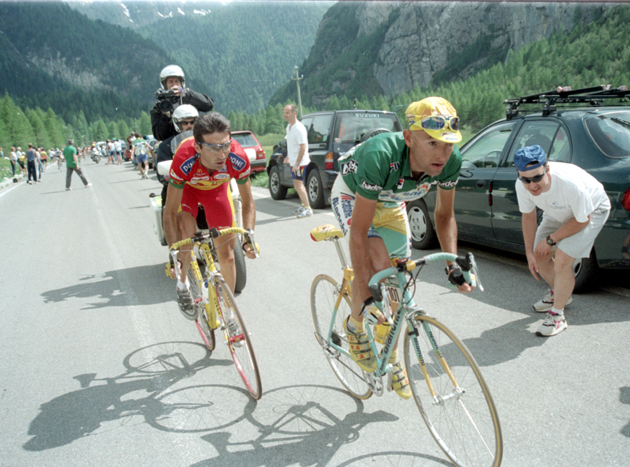 By early 1998 he was showing good form and delivered jaw-dropping performances in the Giro and Tour. In 1999 he was riding even more powerfully and about had the Giro wrapped up when he was booted after a blood test showed he had an excessively high hematocrit. 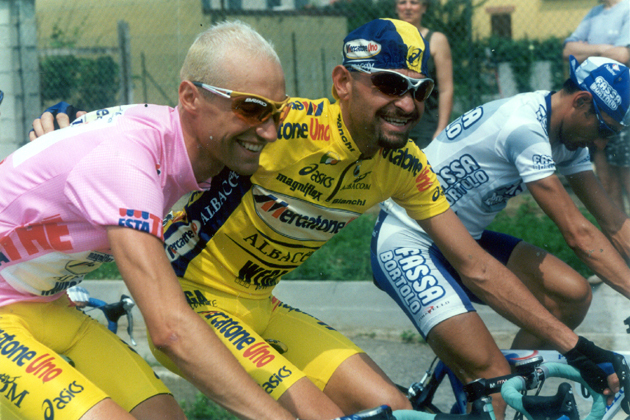 Pantani went into depression, became a cocaine addict and was never again the force he had been in cycling. He was found dead of a cocaine overdose in 2004. Helping oftens starts with an intervention, it would appear that Pantani did not get that kind of help. While he never tested positive for banned drugs (few did back then because there was no test for EPO, the favorite performance enhancing drug of the 1990s and early 2000s), evidence has since piled up that shows Pantani's wins were the product of extensive and heavy drug use. 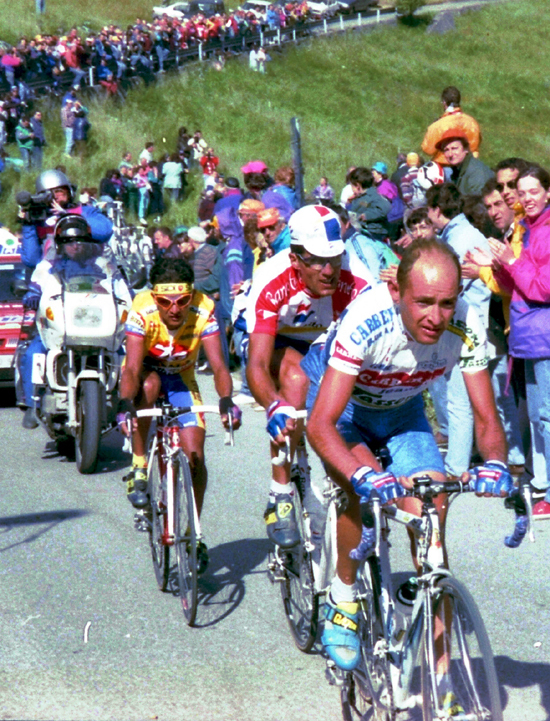 Marco Pantani leads Miguel Induráin and (I think) Nelson Rodriguez to Aprica in stage 15 of the 1994 Giro d'Italia. 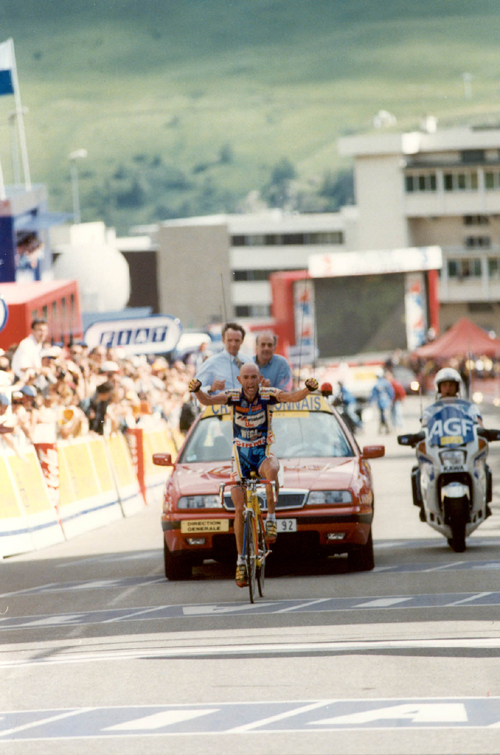 1994 Giro d'Italia, that same stage 15: Pantani wins in Aprica. 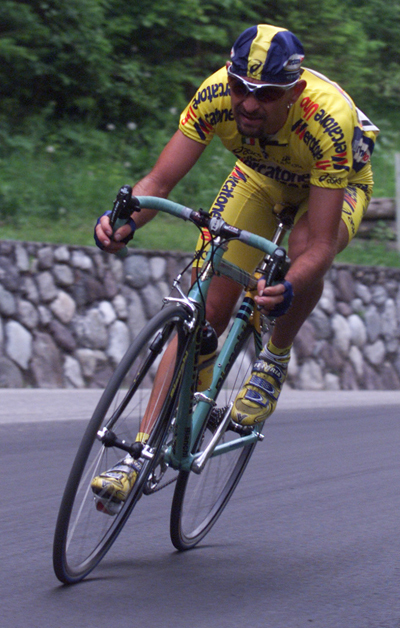 Claudio Chiappucci came in second, nearly three minutes later. 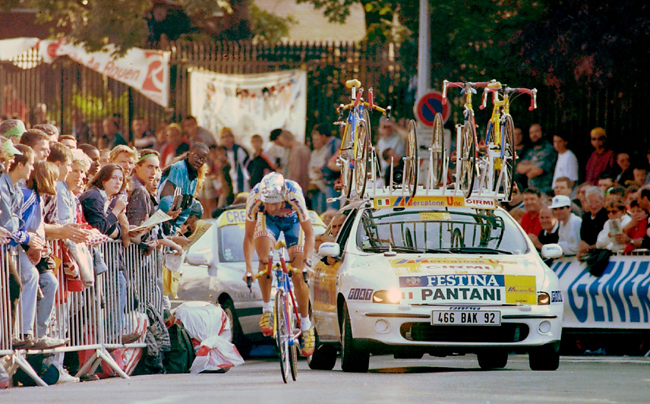 Pantani at the start of stage 2 of the 1995 Tour de France. 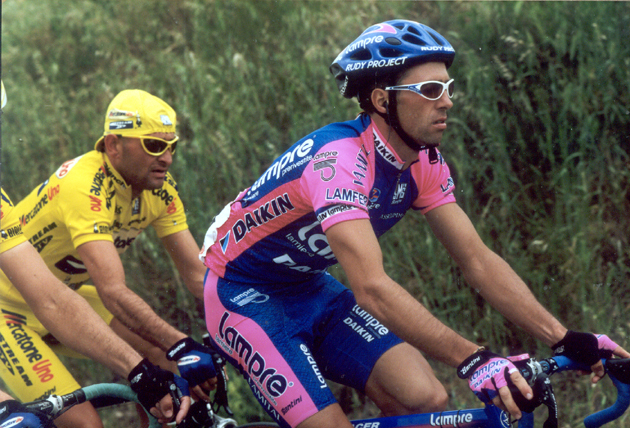 Pantani (right) with teammate Marcello Siboni at the start of stage 4 of the 1995 Tour de France. Pantani gets back on the road after a mechanical during the 1995 Tour de France stage 8 time trial. 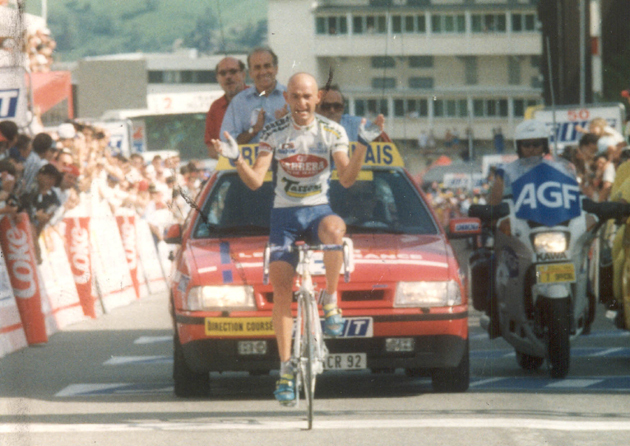 Pantani wins stage 10 of the 1995 Tour de France at the top of l'Alpe d'Huez. 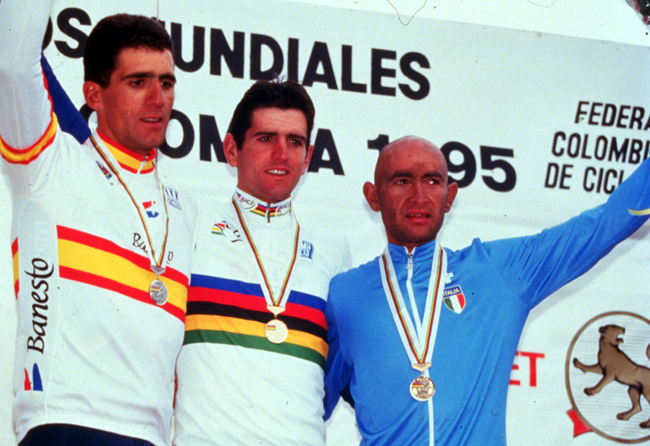 Second-place Miguel Indurain is 1 minute, 24 seconds back. 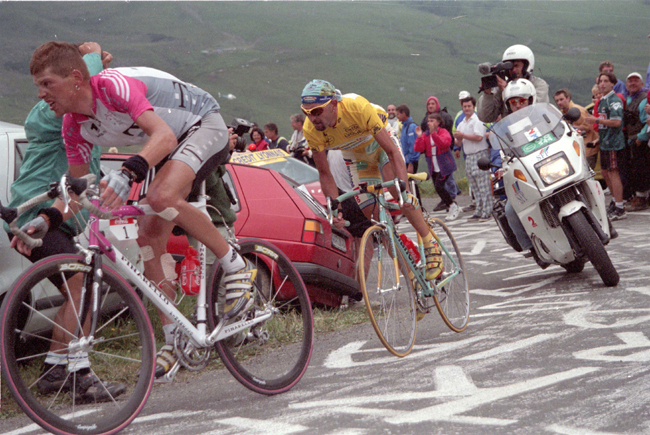 Stage 14 of the 1995 Tour de France: Pantani climbs to Guzet Neige. 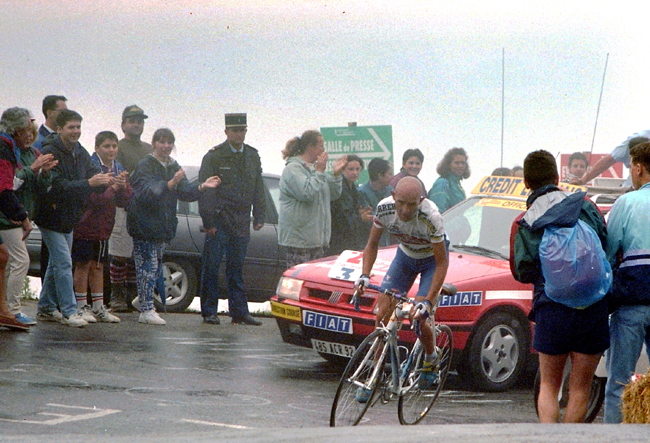 Pantani at the start of Tour de France Stage 15. 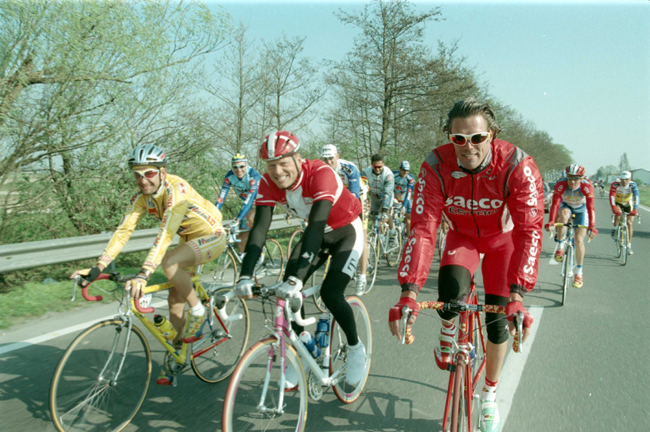 Stephen Roche is on the left. This would be the stage where Fabio Casartelli died after crashing while descending the Portet d'Aspet. 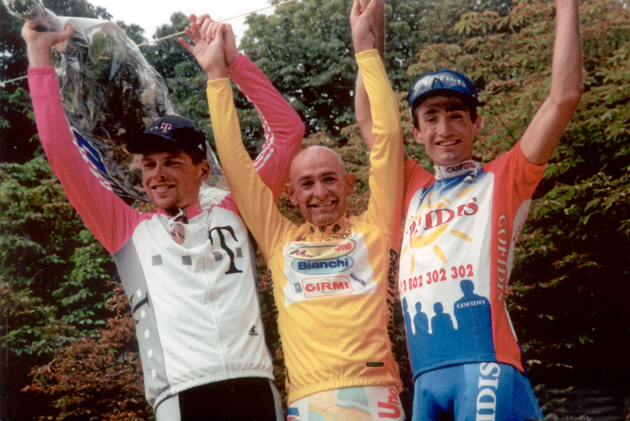 1995 World Road Championships podium, from left: second palce Miguel Induráin, winner Abraham Olano and third place Marco Pantani. 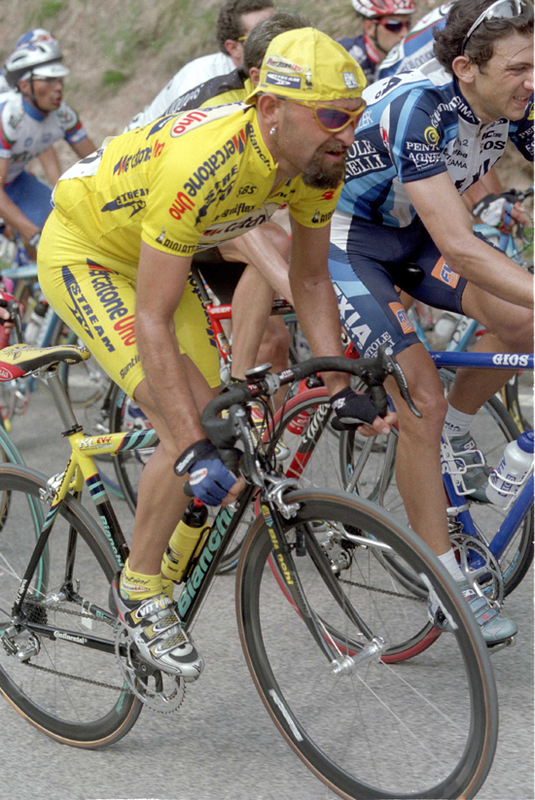 Pantani rides the 1997 Tour de France prologue in Rouen. 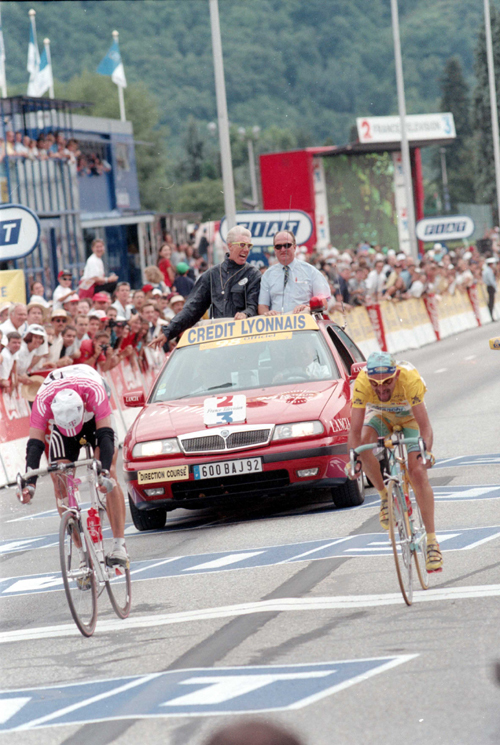 1997 Tour de France, stage 13: Pantani wins at the top of l'Alpe d'Huez. 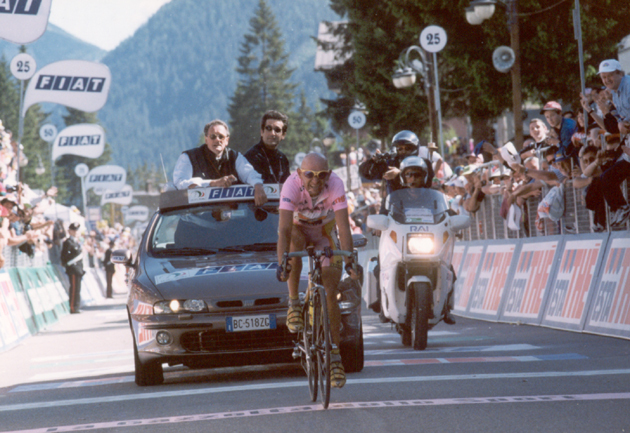 1998 Giro d'Italia, stage 17: Pantani leads eventual stage winner Giuseppe Guerini to the finish at Selva di Val Gardena. 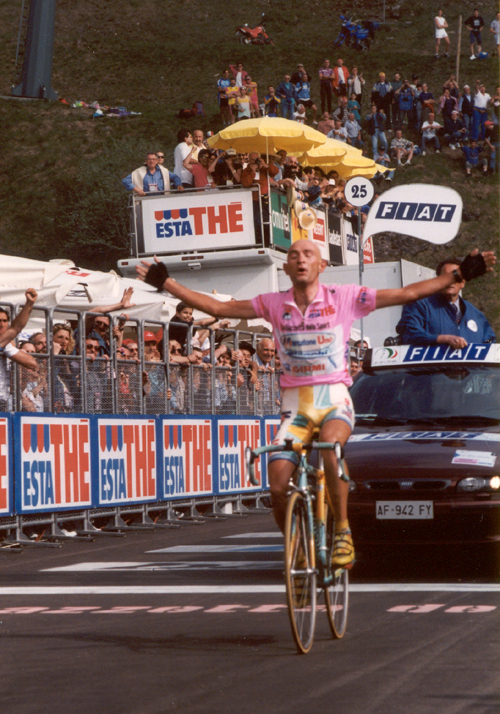 Pantani would exchange his green KOM jersey for the GC leader's maglia rosa. 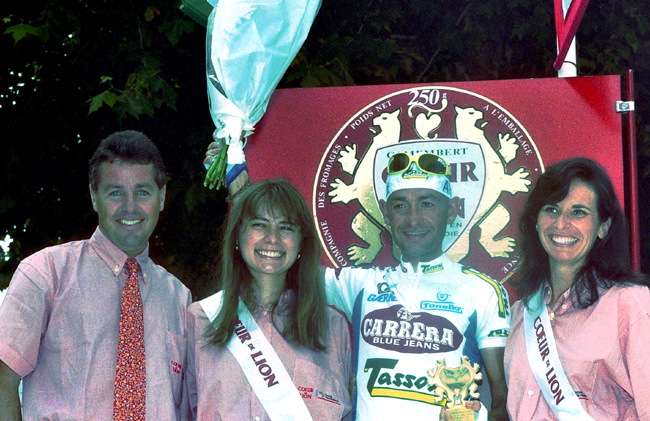 1998 Giro d'Italia final podium. 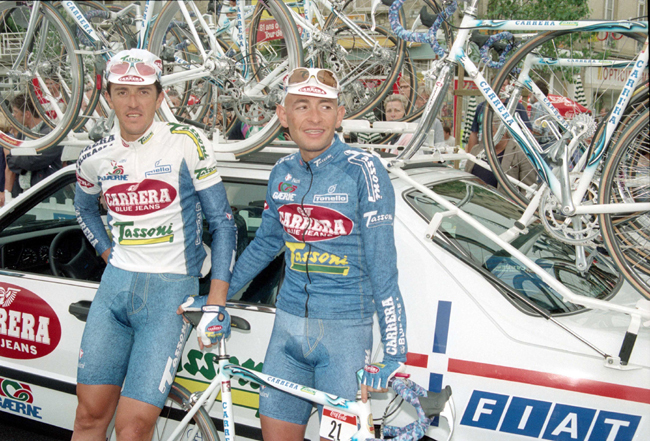 the glum-looking chap on the left is second-place Pavel Tonkov, then Pantani and then third place Giuseppe Guerini. 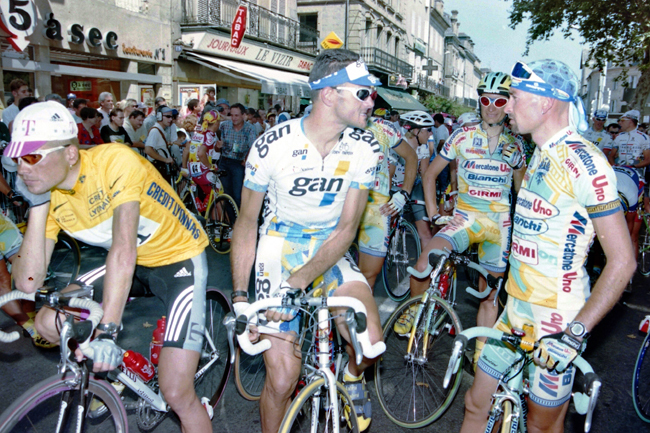 Jan Ullrich (left in yellow) and Pantani (right) wait for Tour de France stage 8 to begin in Brive la Gaillarde. 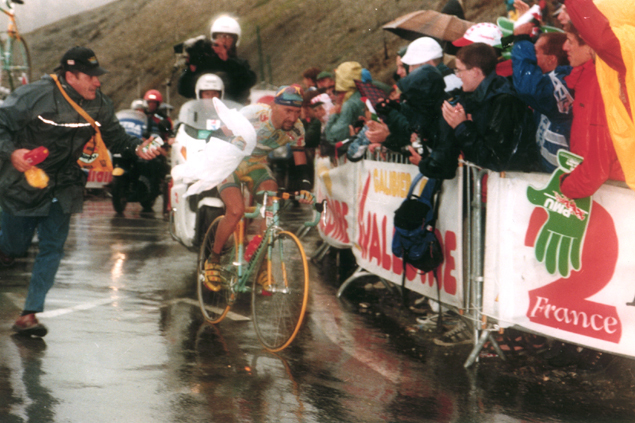 1998 Tour de France: Pantani grabs a rain jacket. 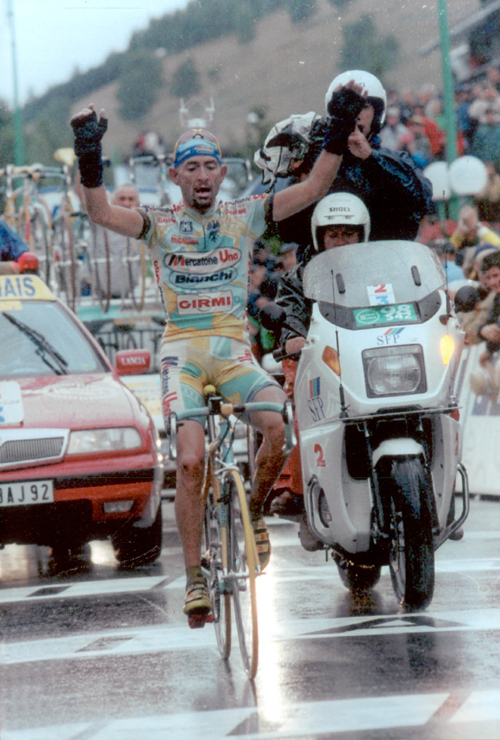 Pantani's first day in yello, stage 16 of the 1998 Tour de France. Here is marks Jan Ullrich on the way to Albertville. 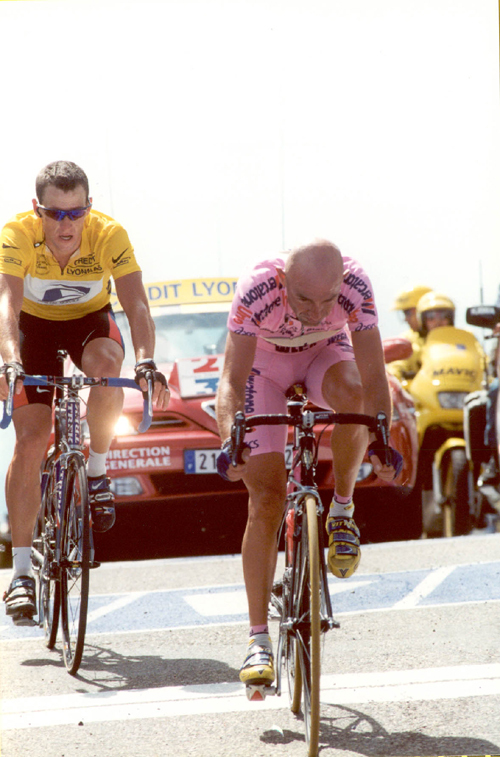 Pantani and Ullrich had broken away in stage 16 of the 1998 Tour de France and here Ullrich wins the sprint. 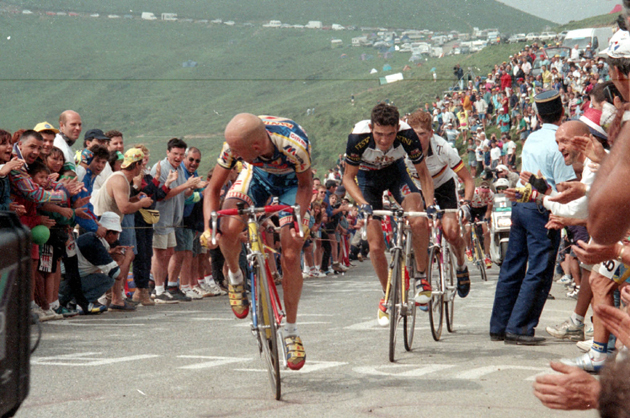 Hardly mattered, Pantani led third-place Ullrich by almost 6 minutes at this point. 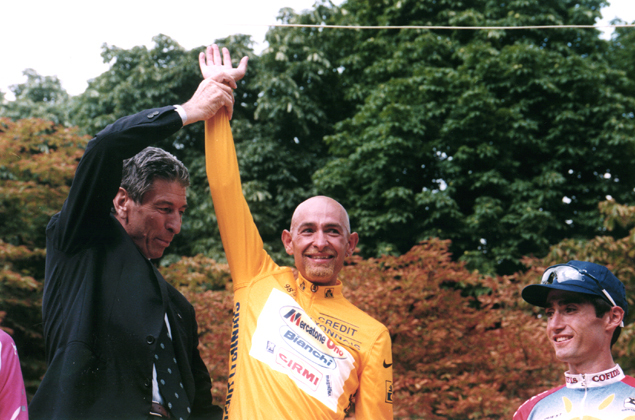 1998 Tour de France: Felice Gimondi, the last Italian winner of the Tour raises Pantani's arm. 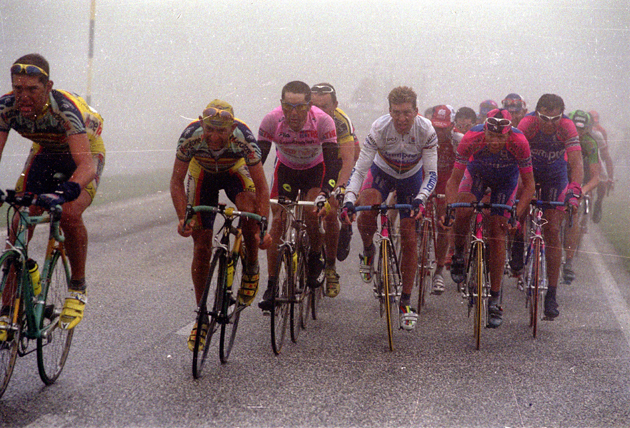 Bobby Julich is to Pantani's left. Before the start of the 1999 season. 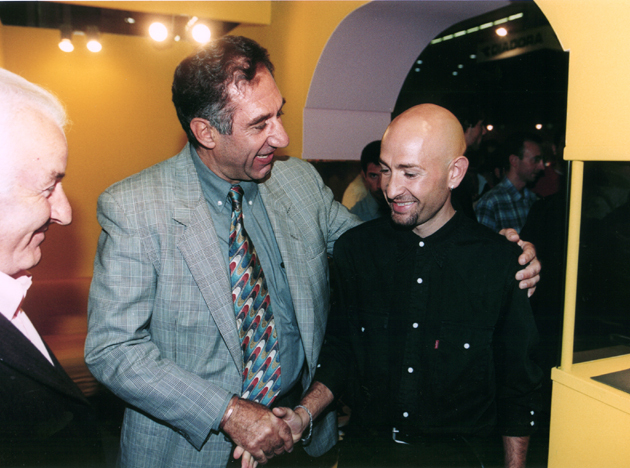 Vittoria Shoes owner Celestino Vercelli shows Pantani the new "Raider" shoe. 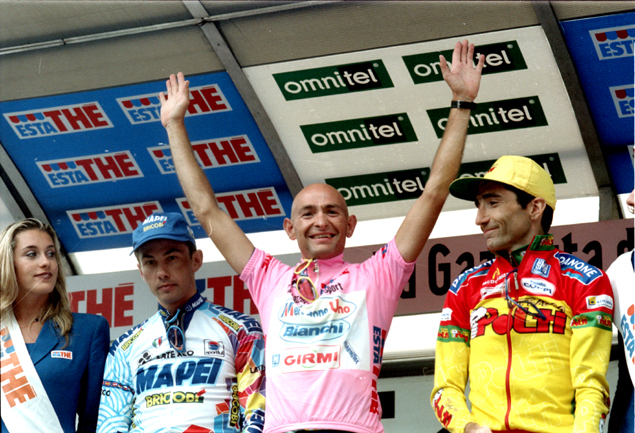 1999 Giro d'Italia: Pantani (out of the saddle) with Laurent Jalabert (pink jersey) and Oscar Camenzind (rainbow jersey). 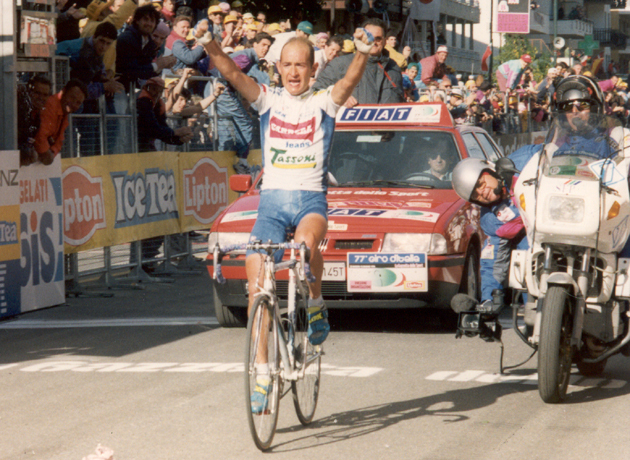 Patani wins stage 19 of the 1999 Giro d'Italia at Madonna di Campiglio. The next morning he would fail the drug test and be ejected from the Giro. 2000, before the start of the season. 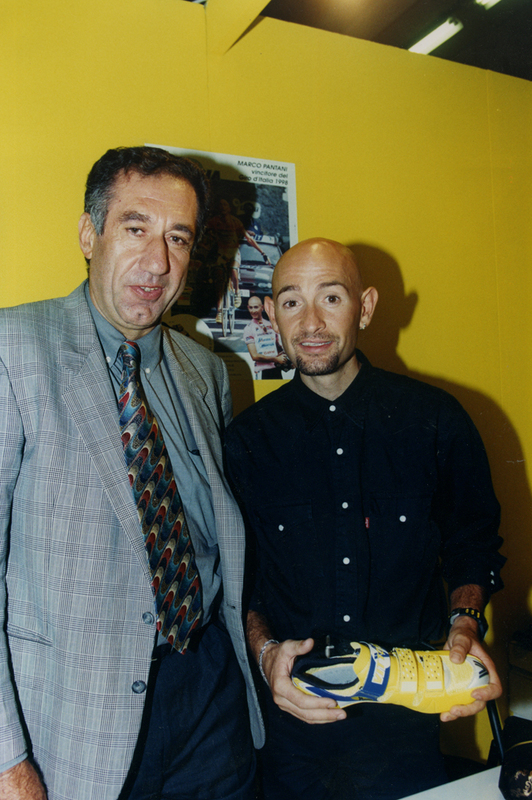 Marco Pantani with Celestino Vercelli, owner of Vittoria shoes, which Pantani wore. Vercelli was a pro on the legendary SCIC and Brooklyn teams. 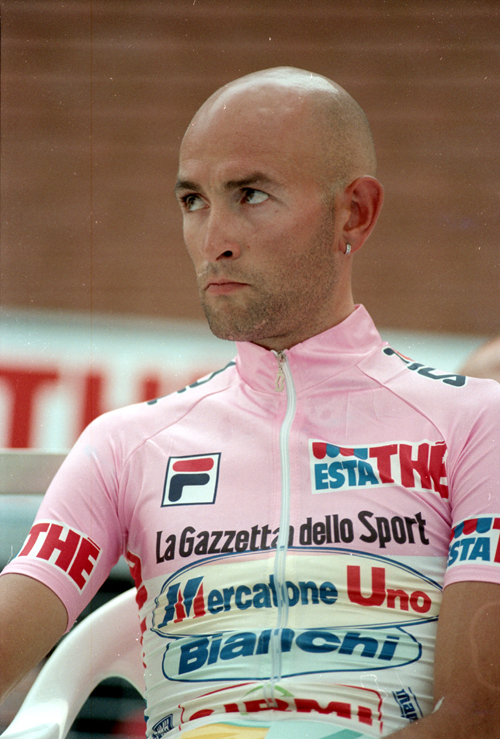 Pantani in 2000 (I'm pretty sure, judging by the kit and shoes). 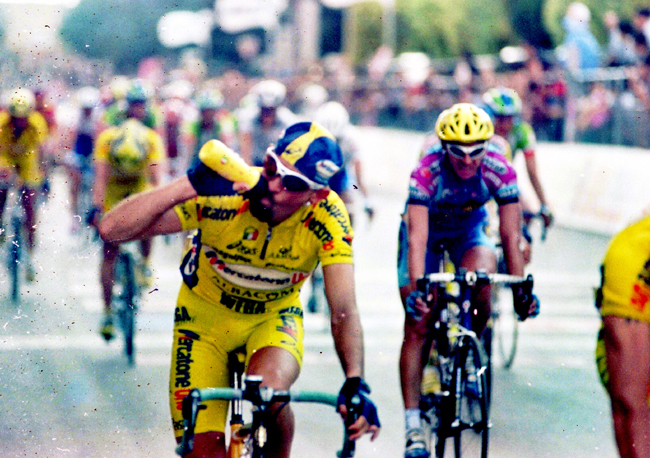 Pantani get a drink at the end of the 2000 Giro's 4th stage. 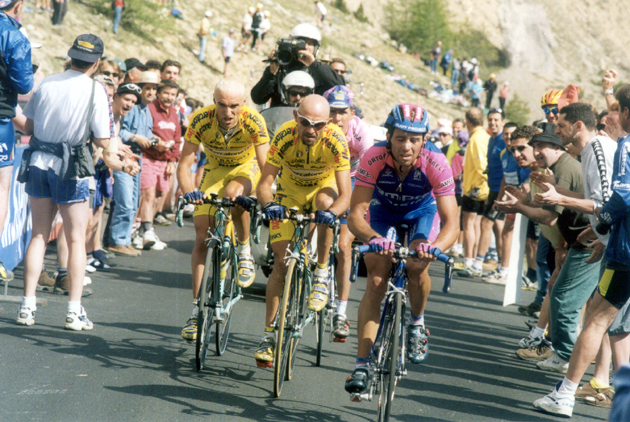 2000 Giro d'Italia: Gilberto Simoni leads Pantani, Stefano Garzelli and hidden, in pink, Francesco Casagrande. 2000 Giro d'Italia. Since Stefano Garzelli took the lead in the penultimate stage, this has to be the final stage. 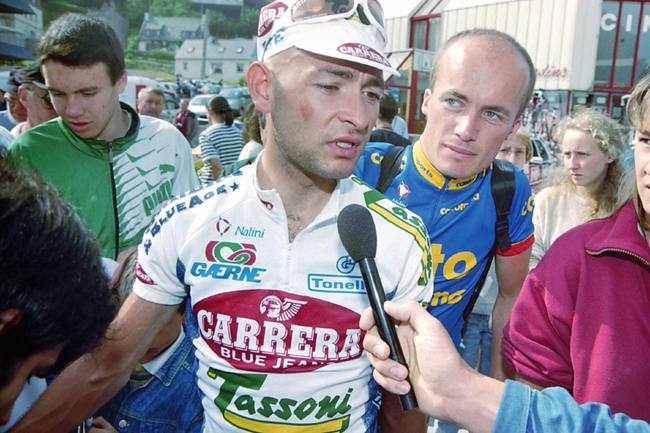 Garzelli is riding with Pantani, who finished 28th.